Stunning Views and Cool Breezes welcome you to your Home in Paradise. Property 6: Stunning Views and Cool Breezes welcome you to your Home in Paradise. Ocean Paradise offer two Villas you can chose one or both of them! Property 7: Ocean Paradise offer two Villas you can chose one or both of them! Spectacular Ocean Views, Spacious Home, and Private Location. Property 10: Spectacular Ocean Views, Spacious Home, and Private Location. Stunning Sunrise from BuenaVista Guesthouse, your Home in Paradise. Property 14: Stunning Sunrise from BuenaVista Guesthouse, your Home in Paradise. Casa Mango is Your Home Away from Home in Paradise. Property 19: Casa Mango is Your Home Away from Home in Paradise. 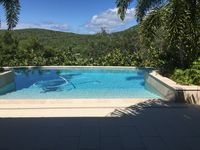 Property 23: Exclusive home with pool and breath taking ocean views..
La Romana A9 at Culebra: great location, great views, neat and clean! Property 24: La Romana A9 at Culebra: great location, great views, neat and clean! Zoni Ocean Views. Walk to Zoni Beach in 3 min! Property 25: Zoni Ocean Views. Walk to Zoni Beach in 3 min! NEW! Culebra Apt-200 Ft From Ensenada Honda Bay! Property 27: NEW! Culebra Apt-200 Ft From Ensenada Honda Bay! We had an amazing week in Culebra and loved the house. It was the perfect home base for our family of 5. As many write, a four-wheel drive is needed to get up the driveway, but once you get up there, the views and breezes are wonderful! We've stayed in other houses on the island and this was one of the best. It has a well-equipped kitchen that we cooked breakfast and dinner in and plenty of space for several people to relax in the evenings. We used the casita for the additional bathroom, but all stayed in the main house to sleep. I highly recommend visiting Culebra and staying at Hilary's house. She's great, by the way, so responsive and a joy to rent from. Our family of 5 just returned from our vacation and stay at this Culebra retreat. Our trip was awesome! The home, pool, farm, and hospitality from Terry and others was first rate. Include the secluded island of Culebra and this getaway was one for the books. Thanks Mary and Terry - we will surely be back!